Our Step Into History Tours #1 and #2 were a success. Those who attended agreed that it was informative, enlightening and a good way to spend some time on a Sunday afternoon. Our next Step Into History Tour #3 takes place on Sunday, June 5. We will be touring the sites of former mills, mansions that the owners lived in and we hope to get inside some of these magnificient edifices for a peek. As always, each tour begins at the Grand Army of the Republic Museum for a personalized tour given by Dr. Andy Waskie. 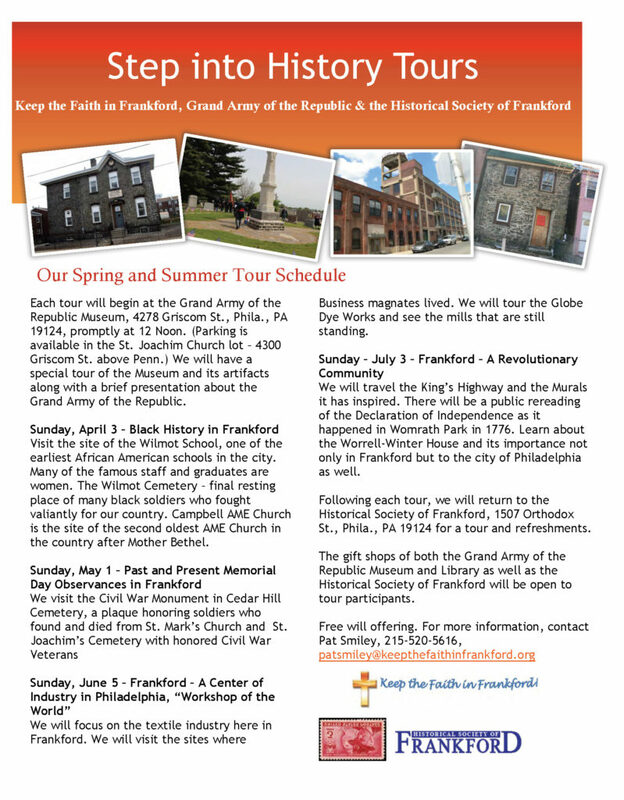 Then we visit the sites in Frankford for that particular day. We finish at The Historical Society of Frankford for a wrap-up and light refreshments.